When most people think back on the 2014 New York Auto show the spectacle that they will remember the most was the Land Rover New Age of Discovery display. From the moment that things got started they put on a show above and beyond everyone else and everyone got a good look at the new Land Rover Discovery concept as well. Visitors traveled down to the flight deck of a retired aircraft carrier for the display of the Land Rover Discovery concept. At the start of the show a multimedia display featuring vivid graphics and a bright display built up excitement for the unveiling of the concept car using an intricate space theme. The show even features a mockup of the Virgin Galactic space shuttle that will begin bringing passengers up to the edge of space. The new concept vehicle has a compact design with sharp masculine features. The wide rounded front end suggests power and gives this vehicle an appealing look. Described as a “premium compact SUV” you would expect this concept vehicle to be built for smooth gliding without much off-roading potential. While it clearly isn’t marketed to off-roaders wanting to drive through big mud pits, and on very serious terrain, more than a few impressive technical features suggest this vehicle will be very capable even on rough terrain. The Terrain Response System employs an array of lasers at the front of the vehicle in order to scan the upcoming terrain and create a virtual layout for later use. This layout is used to adjust the four-wheel drive of the vehicle and to offer guidance to allow the driver to pick the easiest path ahead. The system also uses cameras mounted just under the front of the vehicle to display the section of terrain that the driver can’t see right on the windshield, using a see-through projection. Land Rover has been playing around with laser headlights that emit a very bright beam of light ahead of the driver for improved vision while driving down the road or an off-road path. The best thing about these lights is that they can dim themselves very quickly to avoid blinding oncoming traffic. The system also showcases a low-speed remote control system that will make doing things like hooking up a trailer a simpler task. If you’re on your own hooking up a trailer would be very difficult to do, but with the remote technology it would be a very easy task. The array of technology featured on the new Discovery concept from Land Rover is impressive. These are the features that will set future generations of this luxury SUV apart from the competition, but they are also features that many drivers won’t have available to them right away, and most will require add-on packages when they do finally become available. Either way Land Rover fans have a lot to look forward to with the coming models from this automaker. If you enjoy driving the most technologically advanced vehicles you won’t find much better out on the road today than the 2014 Infiniti Q50 Hybrid. This car is equipped with enough advanced technology to provide several different driving experiences in one. It’s focus is on providing a customized and convenient user-experience, and for the most part it delivers. Personalized keys can be issued for a 2014 Infiniti Q50 that has more than one regular driver. The electronic keys open up the door of the vehicle and configure it to the driver’s personal preferences. Each key is capable of storing mirror positions, the driver’s seat adjustment and steering wheel position. On top of that it will also remember your radio presets and your HVAC preferences. Impressive as these features are, they seem commonplace upon learning that the key can store steering feel presets, shift logic and throttle response to completely alter how the Q50 feels to drive. That means you can have that tight sporty feel or an easy cruising setup depending on your preferences. The Direct Adaptive Steering system that the Infiniti Q50 uses is what makes it possible to adjust steering. Turning the steering wheel generates digital signals that pass through the vehicle and those signals are used to control how the car moves. By passing this information through a computer the car can adjust steering dynamics based on user preference. Even though the steering wheel doesn’t have a direct link to the wheels it’s highly responsive and can feel very sporty. In order to keep the system safe the steering wheel can control the vehicle even if power is lost, so no worries there. An added bonus to this disconnect between the steering wheel and the wheels of the vehicle is the ability to cut out the bumps and jolts delivered by the road in the steering wheel. This gives the vehicle an easy gliding feel even while driving over early-spring potholes. Not all the features on the Q50 are integrated for convenience however, the active lane keep assist is a great safety feature that every car should have. This system relies on a set of cameras to let it know where the lane lines are on the road. The car uses that information to help make sure the vehicle stays in between its lane lines. If it starts to drift in one direction the wheel automatically turns it back the other way so subtly you probably won’t even know it’s happening. With this technology activated it’s easy to track right down the center of most lanes even without hands on the wheel. By relying on similar technology the Q50 can help you avoid fender benders as well. The cameras at the front of the car scan the road for vehicles ahead and can adjust your speed to help avoid collisions even when the driver up front slams on their brakes. Everyone has a moment where they aren’t paying attention as much as they should be, this system helps keep that from being such a danger. Be sure to step on the brake when the system beeps at you though, because after it comes to a complete stop it deactivates and you will begin rolling forward unless you hold the brake down yourself, so it’s not foolproof. Whether you want a smooth rolling cruiser or an edgy sports car you can get the feeling of both vehicles when you drive around in the 2014 Infiniti Q50. If you opt for the hybrid version you get a very respectable level of fuel efficiency for a sports car, and no matter how you choose you will likely enjoy the Q50. The new totally redesigned 2015 Cadillac Escalade keeps up with its name and offers a top quality product that’s a real pleasure to drive. The interior of this vehicle is coated nearly entirely in soft smooth leather. The spots that don’t have leather are outfitted with classy wood or chrome accents. There is plenty of storage room with several large compartments built into the vehicle. With seating for up to eight this vehicle is good for transporting larger families. The customizable digital gauge cluster and advanced media system help give this vehicle an up-to-date feel. With a towing capacity of around 8,000 lbs. this SUV can pull many boats and trailers without a problem. This is thanks to the 420 HP engine that produces up to 460 lb.-ft. of torque. The six speed automatic transmission shifts very smoothly, and the engine emits a deep rich rumble. Equipped with all the standard safety features this SUV is a good option for families. If you’re willing to pay a bit extra you can get nice additional features like adaptive cruise control, lane assist and a blind spot monitor that help make this vehicle even safer to travel in. This update to Cadillac’s flagship SUV is a huge success making this one of the best Escalades produced to date. 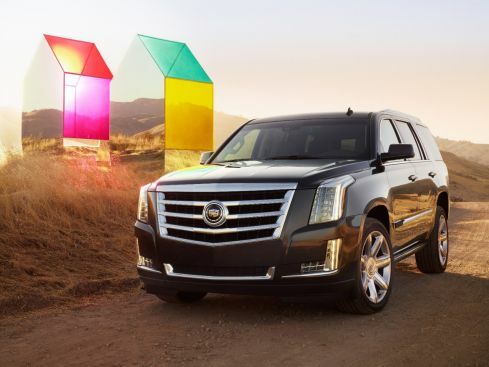 Sure it’s not cheap, but you get what you pay for, and with the 2015 Escalade you get a whole lot.